An Upper Marlboro man was killed in a freak motorcycle crash Sunday afternoon that was sparked, in part, when the man collided with a buzzard, police said. The incident occurred about 3 p.m. on Brown Station Road, near the intersection with Brooke Lane in the Upper Marlboro area, said Cpl. Clinton Copeland. He said a man on a motorcycle had just passed a vehicle on the right shoulder when he collided with a “low flying buzzard.” The impact caused the man to lose control of his bike and veer across the road, where he ran into a curb, fire hydrant and utility pole, Copeland said. The man, 31-year-old David Christopher Norris, was taken to a nearby hospital, where he was later pronounced dead, Copeland said. He said Norris was speeding, and investigators believed that, in addition to the “freakish” collision with the buzzard, caused the crash. Last edited by JTG40cal; May 7, 2012 at 01:39 PM..
Man this is heartbreaking. This is walking distance from my house. I take this route EVERY DAY! In my area we have a bunch of wild animals. Many cars get in accidents with deer. The major issue is vultures tho. They roam around the street whenever an animal is killed or hit by a car. Their so big that they can cause some serious damage. I would suspect that it could have been one of those. I dk though because I wasn't home yesterday. 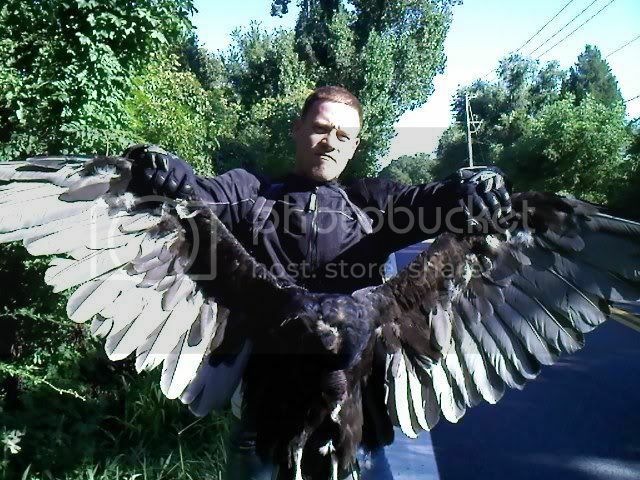 This morning i passed by 20 vultures while on my way to work on the bike. Freaked me out because they came out of no where. As for speeding, everybody speeds over there, including cars. the speed limit is 45mph. Everybody goes 50-55mph. So long as the person was going 5 or more over the speed limit they will declare that a "high rate of speed" was a factor. Probably as a way to justify using their arbitrary speed limits as a means for revenue. I have a friend who had a similar situation. Birds on the side of the road fly off when the bikes got close and loud. All of them dispersed except one flew off in the same direction as the bikes were traveling then made an abrupt u-turn and slammed full force into the lead biker. Broke through the windscreen then broke through the helmet visor and right into his eye socket. He somehow managed to control the bike to a stop, put down the stand, yank the dead bird out of the helmet, and then passed out and was airlifted. With eyeball out of socket and that entire side of his face basically broken, it took quite a bit of reconstructive surgery but he recovered fully and is back on the bike full force. Last edited by nootherids; May 7, 2012 at 02:30 PM.. Passed somebody on the shoulder is not exactly a great commentary on his operation of the bike. Sad to see it. Buzzards are all over the place out here and if he was on the shoulder, there was likely a dead deer that they were eating. Thats not speeding, thats driving.